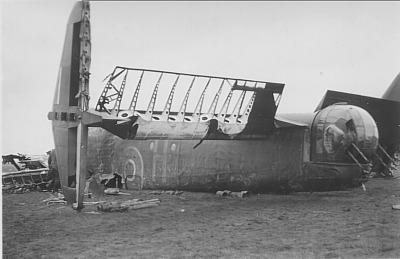 Halifax II JB930 crash landed near Esbjerg 20/4-1943. 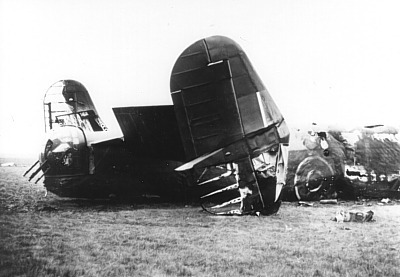 The aircraft belonged to RAF 10 Sqn. Bomber Command and was coded ZA-H.
T/o 21:24 Melbourne. Op: Stettin. When JB930 approached the Danish coast it dropped down to 50 feet above the sea to avoid flak. 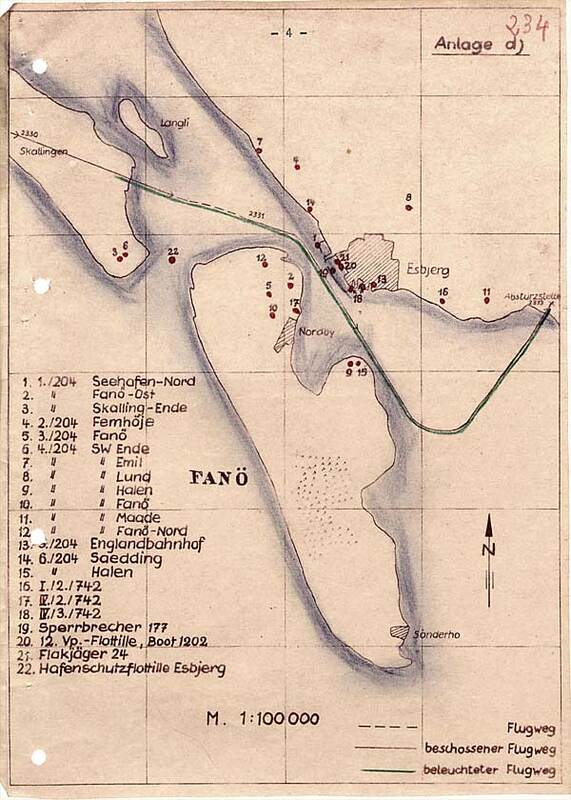 It was coned by the searchlight "Ende" and turned towards south where it was coned by searchlights "Emil", "Lund", "Halen", "Fanø-Nord", "Karl", "Fanø" and "Maade". The managed to keep light on the Halifax for 3 minutes until is chrashed. 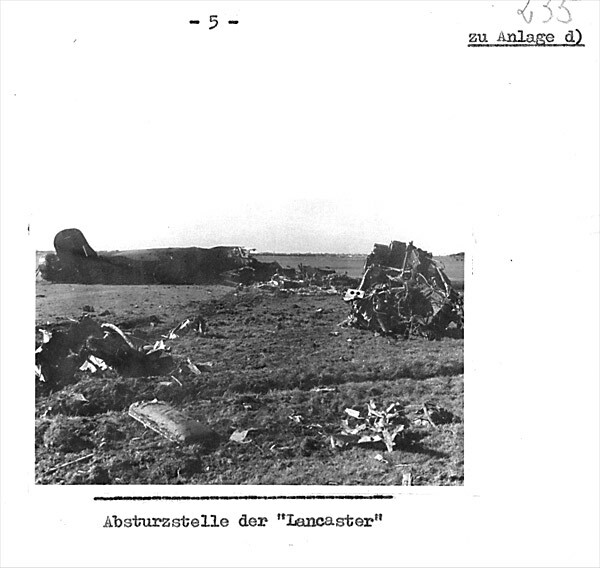 When they crossed the coast near Esbjerg they were however hit by flak from I.+IV./2./lei.Flakabt.742 and IV./3./lei.Flakabt.742 und Marine in the port inner motor and it started burning. Pilot Sgt F. Glover turned on the fire extinguisher, but to no effect so the fire spread to the outboard engine and to the fuselage. At 23:33 hours JB930 crash landed at Gammelby/Velbæk not far from the searchlight Maade. 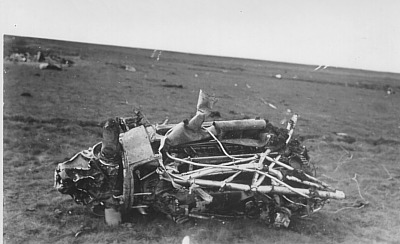 The crew set the aircraft on fire before being made POW`s. 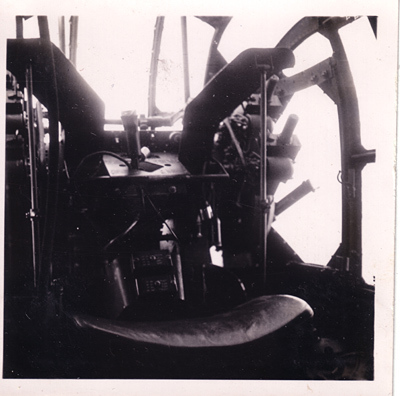 Air Gunner F/lt T.H. Baker left the aircraft by a hole in the fuselage and was running through burning petrol on the ground when he saw rear Gunner Sgt R.E. 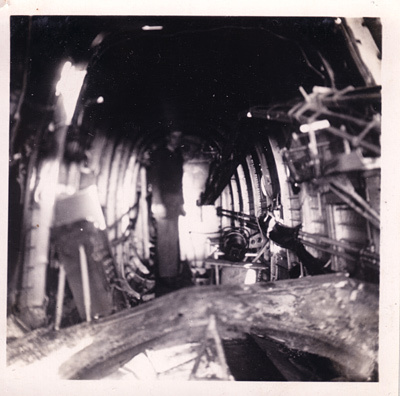 Everett trying to get out of his turret that had locked in centre position. Baker ran to the turret and chopped the doors open with an axe handed to him through the Perspex. Now Navigator Sgt D.E. Taylor came too and pulled Everett out of the turret. Everetts arms were broken and he could not do much himself. The crew consisted of Air Gnr. F/L T.H. Baker, Pilot Sgt F. Glover, Flt. Engr. Sgt R.S. Burr, Navigator Sgt D.E. Taylor, Air Bomber Sgt R. Bell, W/Op Sgt E.J. Phillips and Air Gnr. Sgt R.E. Everett. Six of whom were slightly wounded and were by the Wehrmacht taken to Revier Esbjerg and Marine Lazarett Esbjerg. It is believed that they were sent to Dulag Luft near Frankfurt for interrogation and then passed on to different pow camps. Baker was sent to Stalag Luft III Sagan while Burr, Everett and Glover were sent to Stalag Luft VI Heydekrug to end up in Stalag 357Thorn/Fallingbostel. Taylor was sent to Stalag Luft I Barth and on to Stalag Luft VI Heydekrug to end up in Stalag 357 Thorn/Fallingbostel while Philips whereabouts is not known. Bell appears to have been worse wounded than the rest and spend time in five different POW hospitals. It is known that he spent time in the following POW camps: Stalag IX Mühlhausen, Stalag Luft VI Heydekrug, Stalag Luft IV Gross Tychow and Stalag Luft I Barth. He returned to England on 8/5-1945. Sources: LBUK, RL 19/455, OLCB, Quistionaire For Returned Aircrew (Avery) via Richard Koval.